Hey! Before we go any further, there will no blog next week because I will be traveling. Sorry, but I’ll be out of pocket. HOWEVER, get ready for a new website that is currently unfolding. An Episcopal Priest Fr. Michael O’Donnell and I have been creating an exciting journey following the development of the Church of the first five centuries. Called EARLY FAITH FOR TODAY, Fr. Michael and I are exploring how the original church developed and laid the foundations for what exists today. You will be surprised and intrigued by how the church began. Stay tuned. The details will be forthcoming. Ever hear of the “Angel of Death?” The notorious Nazi Dr. Josef Mengele received that title because he stood on the platform in the Auschwitz death camp deciding with a flip of the finger who would go directly to the gas chambers and who would live for a while longer. In addition, Mengele carried out horrible genetic experiments on prisoners in the Auschwitz chamber of horrors. After Israel became a nation, Mengele was one of the most sought after Nazi war criminals that the Mossad (Israeli secret service) sought. He had obtained documents through the Red Cross and fled to South America. The released Mossad file claims the Red Cross knew he was a Nazi war criminal. But why was Josef Mengele never caught? The New York Times and The Jerusalem Post both recently released stories on Israel’s search for Mengele and why he was never apprehended. Contrary to popular opinion, most of the time Mossad wasn’t looking for Mengele at all. Movies and books like The Boy From Brazil promoted fables about Hitler and glorified the chase to either catch or kill the evil doctor. However, it turns out this was all fiction. In 1960, Simon Wiesenthal, the celebrated Nazi hunter, tipped off Mossad that Mengele was living near Sao Paulo, Brazil. On July 26,1962, a Mossad operative saw a man fitting Mengele’s description standing near a Pharmacy run by one of his friends. Mossad was notified, but the same day the agency discovered Egypt was recruiting German scientists to build missiles. The matter was dropped. At that time, Mossad was only in the developmental stage and they had a limited number of agents and a tight budget. The Egyptian situation was immediate and highly threatening. Next came the need to gather data on what would become the Seven-Day War. Mengele stayed on the back burner. A decade passed and Menachem Begin came to power with a greater interest in catching the doctor and believed settling the score with Mengele would demonstrate the price to be paid for hurting Jews. Mossad brought the matter to the front burner. 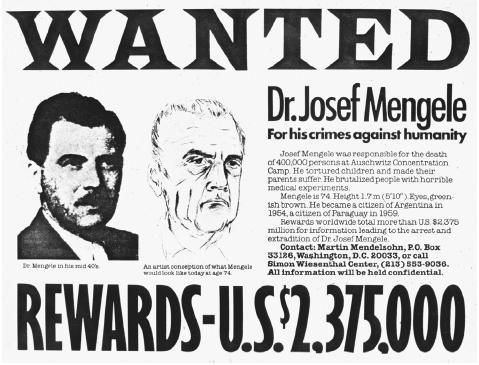 Unfortunately for Mossad, in 1979 Josef Mengele died while swimming off a Brazilian beach. Because he had a rich family who always knew where he was, Mengele had survived longer than he should have. However, the moral of the story remains. Mengele’s life was spent running, hiding under a rock, and finally drowning. Sounds like a decent revenge to me.